You may be surprised by what makes the best core exercises. It may not just be sufficient to carry out sit ups and abs crunches if you lack special equipment. To really build a strong and solid core, you require exercising a good number of muscles starting from your hips all the way to your shoulders. The majority of people tend to view the core as a toned abdomen or a lovely 6-pack. However, the fact is that your abdominal muscles only form a portion of your core muscles. What the experts refer to as your “core” will in reality consists of lots of diverse muscles which all go towards stabilizing your pelvis and the spine, running the entire torso length. It is when these muscles are contracting that they bring the needed stability to your shoulder girdle, the spine and the pelvis to create a solid support base. When this has occurred, you will then be in a position of generating powerful and extreme movements. Your core muscles also make it possible for you to remain upright and move while on two feet. It is these muscles which assist in movement control, energy transfer, and weight shifting into any direction you wish. A solid core protects your body by distributing the weight bearing stresses. How Does a Good Core Strength Benefit You? The awesome thing is that you can carry out your core workout routine without equipment exercises and still remain in top shape and condition. It doesn’t have to be expensive. You don’t need all those costly exercise equipment such as dumbbells and kettlebells or necessitate you joining your local gym. Abdominals typically receive all the credit in terms of giving protection to your back and being the pillar of your strength, although they only form a small portion of what constitutes the core. As a matter of fact, it is the unbalanced and weak core muscles that are associated with your low back pain episodes. Balanced and stronger core muscles assist towards reducing spine strain and maintaining appropriate body posture. Due to the fact that the trunk muscles and torso will accord stability to your spine all the way from your pelvis to the shoulder and neck, they facilitate the transferring of power and energy to your legs and arms. 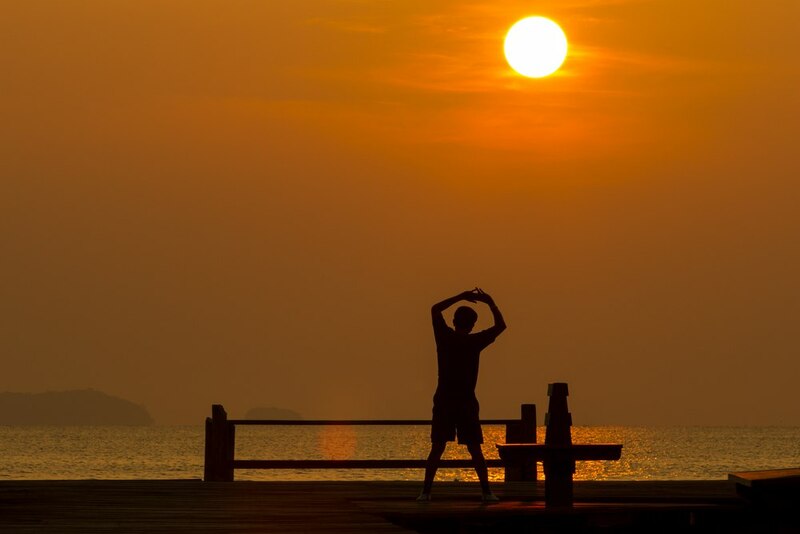 All those body powerful movements typically originate and start from the center of your body outwards and never originate from your limbs alone. Prior to any kind of rapid and powerful muscle contractions in the body extremities, your spine has to be stable and solid. A good exercise routine strengthens your core muscles. Training your core muscles helps towards correcting postural imbalances which are potential sources of injuries. Perhaps the biggest benefit you will receive from core training is developing your functional fitness. This is the fitness type which becomes essential to your regular activities and daily living. You will not be seen to be struggling and dragging that body around. You will look alive! There are lots of core workout routines without equipment exercises which can greatly assist you. Quite a huge number of such core strengthening exercises could be easily performed while you are at home without the need of having any specialist or expensive equipment. Core exercises bring the best and most effective outcomes when they are engaging lots of muscles across your entire torso. These are those muscles which cross a number of joints and which are working together towards bringing and coordinating your body stability. Core muscles must operate as a unit to stabilize your spine. Among the best core workout routine exercises are simple without equipment bodyweight exercises. Because the easiest and best core workout routine without equipment involve the abdomen, let us now turn our attention to what would benefit you the most. This is a comfortable routine that is comprised of 7 abdominal exercises which have been carefully selected to hit both your lower and the upper abs. Follow the guidelines I have prepared for you below to get a totally ripped core. Nothing is for sure more impressive than when you present a physique that is well built with a six pack of some well defined abs leading the way. However, keep in mind that about 50 per cent of the results you get will be largely determined by what you put into your diet. The routine below is guaranteed to give you rapid results and is made up of some basic 7 abdominal exercises that have been carefully selected. You are going to note that I am not proposing any direct oblique work. The reasoning behind this is that I’m convinced that direct oblique work will only lead you having a waistline that is wider. Besides that, it is known that obliques typically receive ample indirect stimulation when you carry out exercises such as sit-ups, deadlifts and squats. 1. On your back, lie flat on the floor with bent knees and the legs secured below some solid heavy furniture. 2. Have your hands by the chest. 3. As you flex your abdominals, try raising the torso until you are almost in a sitting position. 4. Still retaining the abs tension, lower yourself to the original position without rocking back and forth. The primary target here is your Lower Abs and the secondary targets are your Upper Abs and Obliques. 1. On your back, lie flat on the back with the legs straight before you. 2. Have your hands on the floor at your sides for support. 3. 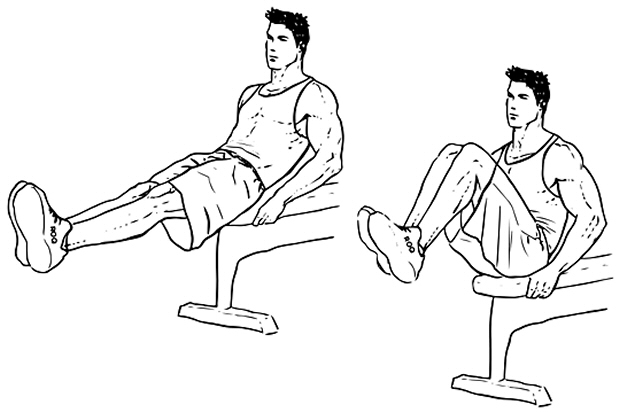 As you flex your lower abdominals, try and raise the legs until they are in a perpendicular position with the floor. 4. While holding the abs tension, lower the legs to the position you began with. The targets are the Lower and Upper Abs while the secondary targets are the Obliques. 1. While on your back, lie flat on your floor with both legs ahead of you. 2. You can place both your hands on the floor for better support. 3. Try and flex your lower abs, raising the legs until they appear in a perpendicular position to the floor. 4. At this juncture, raise both your torso and shoulders as far as you can from the ground in a motion that is somewhat curling without having to raise your back off the floor. 5. While maintaining the abs tension, lower both the legs to the starting position and then bring the torso to the original position where you began. The primary targets are your Lower Abs and secondary are the Obliques and Upper Abs. 1. Sit on your floor or even on an exercise bench or chair edge with both the legs extended ahead of you with the hands on the floor for the needed support. 2. Maintaining your knees close together, pull them in towards the chest until they can go no more. 3. Retaining the lower abs tension, revert to the position where you began and repeat this motions until the set is completed. 1. Sit on your floor or even on an exercise bench or chair edge and your legs fully extended ahead of you and the hands holding on your sides for needed support. 2. Bring your legs up simultaneously as far as you can whilst bringing your torso towards them at the same time. 3. Revert to your original position and repeat until the set is done. 1. Lie flat on your back while on the floor with both legs ahead of you but bending them at the knees. 2. Have can place both hands by your chest or behind your head. 3. Now raise the torso and shoulders as far as they can go in a curling motion from the ground without having to raise your back off the floor. 4. Still retaining abs tension, bring the torso to the original starting position and try to avoid rocking back and forth. The primary target areas are the Lower and Upper Abs, while also targeting the Obliques as the secondary area. While on your back on the floor, lie flat with the legs straight ahead of you. 1. Have both your hands at the floor for needed support. 2. Gradually bend the legs at your knees to bring them towards the chest. 3. When your knees are next to the chest, try and raise the torso and your shoulders as far as you can get from the ground without having to raise your back from the floor in a curling motion. 4. Now return both the legs to the position where you started and also bring the torso back to the level of the floor. Each of the exercises is to be performed for three (3) sets each, in as many reps as you could possibly do. However there are lots of ways performing this core workout routine without equipment exercises. Really, it’s up to you depending on your personal goal! It is however worth noting that the higher intensity routine sets may be viewed as an advanced abdominal core workout routine undertaking and would not be strongly recommended for absolute beginners. A newbie would gain better by just carrying out 3 out of the total of seven (7) for only two (2) sets each with a one minute of rest observed between the sets. It is from there that you can begin to build up levels of endurance and then begin to add up more sets and exercises over time. I would recommend doing these exercises, plus any aerobics as the first thing each morning. If you are somebody who wishes to add on some simple or even advanced weight training, then do this during the afternoon. This way, you will be spiking up your metabolism twice each day. It is recommended that you carry out this core workout routine at least 3 days weekly. However, remember that you are not going to start seeing your abs shaping up unless you are also consuming slightly less calories compared to what is burnt by your body. Note: this does not mean you start denying your body food and going on starvation rations! What I am alluding to are 5-6 small meals daily for men and between 4 and 5 small meals for the women, which are made up about 40% Protein, 40% carbs and 20 percent fats each. Additionally, make sure that at least you are doing 3 days of routine cardiovascular work. In case you are not in a position of carrying out a specific activity for instance owing to injuries to your lower back, then you are free to substitute that particular for another one which does not cause stress to the back. If you are a bodybuilder who has made good advances, the quickest outcomes will be achieved by performing this core routine daily together with some aerobic or cardio exercise each morning before your start your other activities. Always keep in mind that the above routine core exercises will not really matter or bring desired results if your diet is not properly dialed in. So remember to stick to your healthy diet, train consistently and hard. You will be amazed at how you can easily bomb away using the above core workout routine. You will be in awesome shape in no time!